— It all began with a beep. 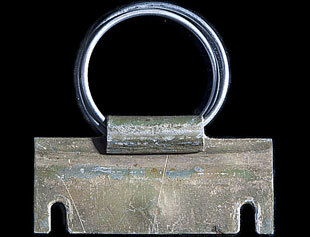 But were it not for the only remaining piece of Sputnik 1, it might not have started at all. Compared to the world's first satellite as a whole, it is not at all impressive. 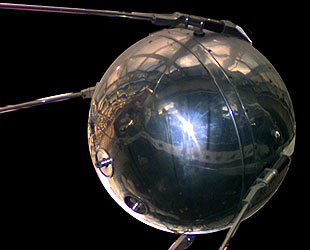 At 23-inches in diameter (closer in size to a beach ball than the often-compared basketball), the finely-polished aluminum Sputnik sphere dwarfs its single surviving part. The satellite's four whisker antennae look even more dramatic when contrasted with their testament to time and history. Taken out of context, this rare artifact would look more at home in a museum gift shop display of key rings than in the museum exhibit where it presently resides. In context however, the metal arming key, which once sat in between Sputnik's batteries and radio transmitter while the satellite was being prepared for launch, preventing the chance of premature "beep", is the space age equivalent of the rope that moored Columbus' Santa Maria to Spain's dock. Once removed, both signaled a sea of possibilities. Sputnik's arming key is the property of a private collector, Arthur Dula, an attorney and aerospace entrepeneur, who is also the literary executor for the estate of author Robert Heinlein. Dula loaned the key for display at the National Air and Space Museum in Washington, D.C. (bringing this countdown full circle). Appropriately, the key is part of the Smithsonian's Space Race gallery, surrounded by the spacecraft, spacesuits, rockets, and later satellites that Sputnik inspired. Though diminutive in size, the key is large in stature, deserving of the attention it is paid besides its larger descendants. Without the key, other than not having a physical remnant of the original Sputnik today, the satellite's batteries could have drained back in 1957, robbing most of the world of their only authentic memory of the Earth's first man-made moon. While many recall spotting the satellite in the sky, they more likely saw Sputnik's larger and as such brighter booster's upper stage. The beeps that they heard, either by shortwave or during re-broadcasts on the radio were of the pioneering Soviet spacecraft. Despite a few claims to the contrary, Sputnik 1 is known to have completely disintegrated upon reentry on January 4, 1958, less then three months after entering space. By the time of its demise, the Soviet Union had already sent a second satellite into orbit with the first animal on-board. The United States would launch its own first satellite later that same month. Sergei Korolev, Sputnik's Chief Designer, knew that the world would want to display the satellite, even if the real article was destined to be destroyed. He reportedly once admonished a worker for the lackluster shine on a mock- up. "This ball will be exhibited in museums!" he scolded. As this countdown has shown, Korolev's prediction came true multiple times over, with many Sputnik replicas now spread across the planet. 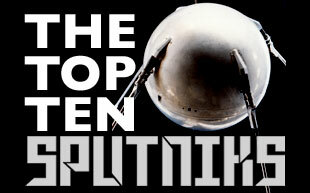 But there is only one remaining component of Korolev's original creation, the Sputnik that started it all.